Located in Western Sichuan, the Yading Nature Reserve contains three holy mountains, all of which are around 6000 meters tall. It’s one of the most beautiful places I visited while backpacking around China for two months. I visited Yading with the goal of trekking around Mt. Chenrezig, the tallest of the three holy mountains. If you plan on visiting Yading, I highly recommend this trek, but Yading can also be visited without doing a serious trek. If you’ve got more time, there are week-long trekking routes that take you around all three holy mountains. In this post, I’ll go over everything you need to know about visiting the Yading Nature Reserve and how to trek around Mt. Chenrezig. The Yading Nature Reserve is located in a pretty remote part of China. 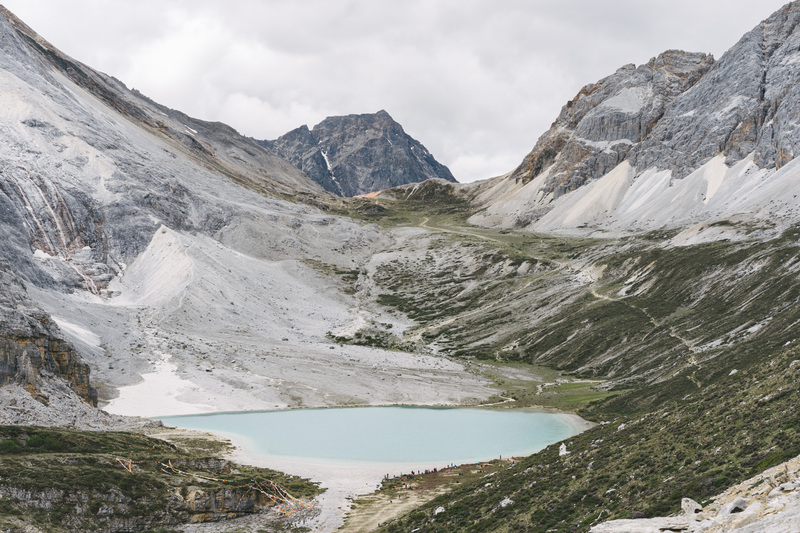 It’s in Western Sichuan, far from any large cities or high-speed rail routes. As of 2013, getting to the Yading Nature Reserve has become much easier with the opening of the Daocheng Yading airport, the world’s highest altitude civilian airport. The airport has direct flights from Chengdu, Chongqing, and Xi’an. 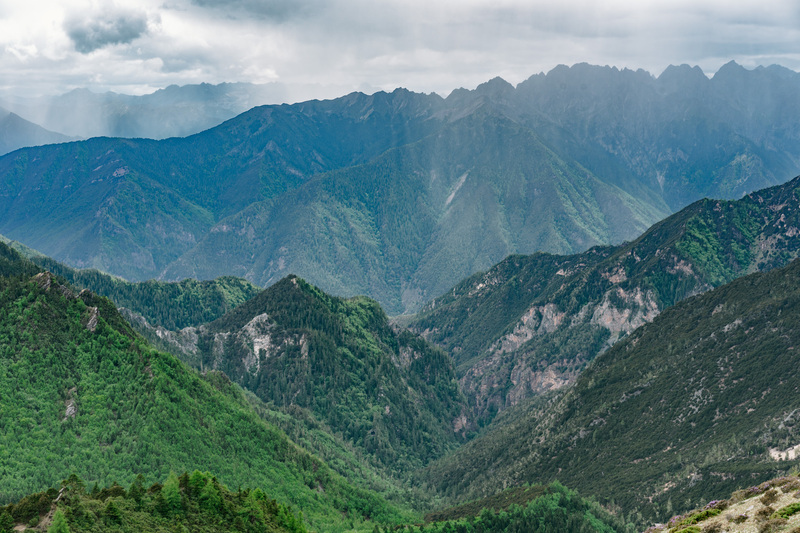 If you’re feeling adventurous, you can take the overland route from Chengdu to Shangri-La (or vice-versa), and stop at Yading along the way. The overland route through Western Sichuan is incredible, and I guarantee it will be one of your favourite travel experiences. It will take about 10 days to complete the overland route with a stop at the Yading Nature Reserve. Check out my post on the overland route from Chengdu to Shangri-La for more info. After you arrive in Daocheng (via flight or overland route), you’ll need to get to Riwa. Riwa is a very small town located at the entrance area to the nature reserve. From Daocheng, you can find buses and minivans that leave from near the bus station. Try to get there early – I had arrived in Daocheng quite late and had to wait five hours for my shared minivan to fill up. The journey from Daocheng to Riwa will take about 3 hours. It’s a gorgeous drive so try to get a window seat! In Riwa, there are a few hotels that you can stay at. The town is very small, so just walk around until you find one you like. From the main area of Riwa, the entrance to the Yading Nature Reserve is about two kilometres down the road. I walked there, but you could also take a taxi. At the entrance area, you’ll need to pay the admission fee. The fee is ¥150 for admission, and ¥120 for the sightseeing bus. Unfortunately, the sightseeing bus is not optional, so you’ll end up paying a total of ¥270. The sightseeing bus takes you from the entrance area to the actual park, a 20-kilometre drive on windy mountain roads. There is a very small town at the actual entrance to the reserve (near where the sightseeing bus will drop you). The town is known as “Yading Village”. There are hotels here, and it’s a good place to spend the night after hiking in the park during the day. After taking the sightseeing bus into the nature reserve, you’ll be dropped off near the Chonggu Monastery. This area is where all the different paths around the nature reserve come together. If you’re not planning on trekking around Mt. Chenrezig and just want to visit the main sights of the nature reserve, you will still start here. To get to the Luorong Grasslands from Chonggu Monastery without hiking, there are electric carts that transport tourists along a paved road. The electric cart costs ¥50 one-way or ¥80 round-trip. After exploring the Luorong Grasslands, you can either hike or ride a horse to Milk Lake. Horse rental is ¥300 for a round-trip ride. To visit anywhere else in the Yading Nature Reserve you’ll need to do some hiking. The most popular trek in the Yading Nature Reserve is the 1-2 day long pilgrimage circuit (kora) around Mt. Chenrezig. I did the trek in one day, but if you hike at a more relaxed pace I’d recommend taking two days. The first stage of the trek will take you towards the Luorong Grasslands. For this section, the pathway is either a paved road or a metal grid pathway through the woods. The paved road is used by electric carts that shuffle domestic tourists to the grasslands, so I’d recommend walking on the pathway rather than the road. From the Chonggu Monastery to the Luorong Grasslands it’s 6 kilometres of walking with an elevation gain of 180 meters. This stage shouldn’t take you longer than two hours. The Luorong grasslands are at an elevation of around 4180 meters, so you’ll definitely be feeling the altitude unless you’re already acclimatized. When walking through the grasslands, you’ll get amazing views of all three holy mountains in the nature reserve. There are a few Tibetan huts here, and the locals provide horse rides to the domestic tourists who don’t feel like walking to Milk Lake. The pathway through the grasslands is a wooden boardwalk and is very easy to follow. After walking through the grasslands for a couple of hours, you’ll reach the end of the walkway and begin the steeper climb towards Milk Lake. The ascent to Milk Lake is fairly steep and is a little unsafe due to the large numbers of domestic tourists who don’t really know what they’re doing. From the Luorong Grasslands to Milk Lake, you’ll cover a distance of 5 kilometres and gain about 300 meters in elevation. Budget around two and a half hours for this stage. Continuing past Milk Lake, you’ll now likely be alone on the trail (other than a few Tibetans completing the Mt. Chenrezig kora). After taking in the sights at Milk Lake, your next goal is to cross the First Col at roughly 4,700 meters in elevation. The trail from Milk Lake to the First Col is well-defined. Keep Mt. Chenrezig on your right and you can’t get lost. 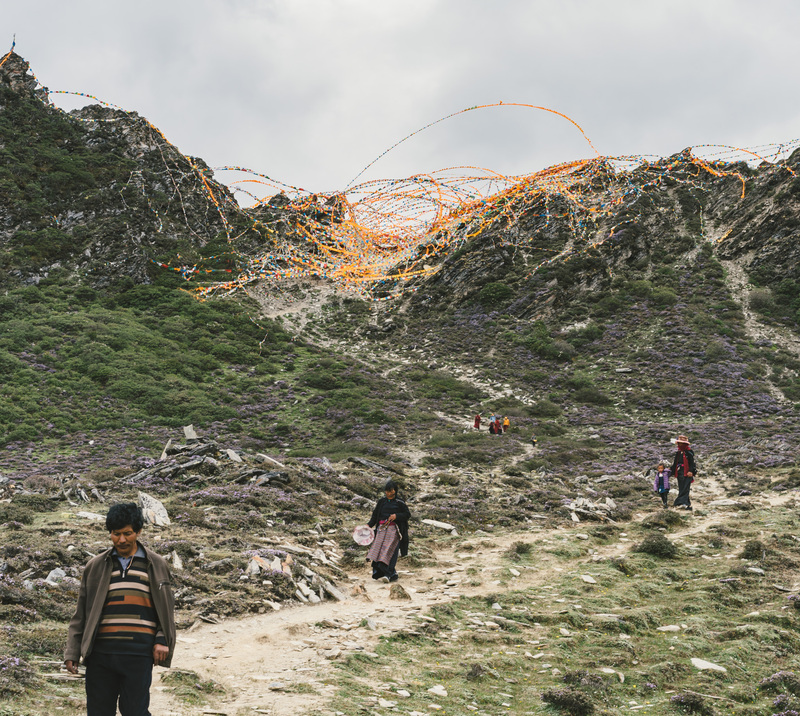 Crossing the pass isn’t too difficult, and the top of the pass is covered in a ton of prayer flags. From Milk Lake to the First Col, you’ll gain 250 meters in elevation and cover about 1.5 kilometres. This stage shouldn’t take longer than an hour. A few hundred meters after crossing the First Col, you’ll come across a fork in the path. The fork is marked by a prayer wheel on a wooden pole. Be sure to go right at this fork. If you go left, you’ll end up lost in another valley. After going right at the fork, you’ll begin a descent into a meadow filled with lavender. In the meadow, you’ll see stone huts used by Tibetan shepherds. If you’re camping, this is a perfect place to set up (You aren’t allowed to camp anywhere before the First Col). Continuing on for an hour or so, you’ll descend a few hundred meters before beginning an ascent back up to the Second Col. The trail here is still well-defined, just keep Mt. Chenrezig on your right and you won’t get lost. From the First Col to the base of the Second Col, you’ll hike about 6 kilometres and lose about 350 meters in altitude. Should take a little less than two hours. After a bit of a walk from the lavender meadow past some more stone huts, you’ll get your first views of the Second Col (4,665 meters). The climb to the top of the Second Col follows an obvious path but is definitely the toughest part of the trek. You’ll be quite tired at this point, so ascending back to 4,665 meters is difficult. Take it slow, and soon enough you’ll be at the top of the Second Col. Like the First Col, thousands of Tibetan prayer flags mark this pass. Crossing the Second Col will take about 1.5 hours. Descending from the Second Col to Pearl Lake is nice and easy. It’s all downhill from here, so the thicker air will make you feel nice and strong again. Continue to follow the path and you’ll pass through a pine forest and eventually end up at Pearl Lake. Upon reaching Pearl Lake, you are now back in the “tourist zone” of the nature reserve. From the Second Col to Pearl Lake, you’ll cover about 3 kilometres in distance and descend about 500 meters. When you arrive at Pearl Lake, there are posted signs and maps that you can follow the rest of the way back to Chonggu Monastery. From Pearl Lake to Chonggu Monastery is another hour or so. From the Chonggu Monastery, catch the sightseeing bus back to either Yading Village or Riwa. The best time to visit the Yading Nature Reserve is in the fall (September and October). The trees will turn a golden-orange colour and the entire nature reserve will look incredible. Spring (April and May) is also a good time to visit. The summer months get a lot more precipitation, but it’s still possible to visit. In the winter, it will be cold but still beautiful. Here are a few tips to make your visit to the Yading Nature Reserve even better! Bring proper sun protection. At high altitude, the sun is a lot stronger and you’ll burn very easily. Trust me, I’ve made this mistake before. Drink at least four litres of water a day. Drinking water helps you acclimatize much faster. Bring proper hiking clothes. While it may be warm at the Chonggu Monastery, it can be much colder up by Milk Lake. There are longer treks you can do in the region, but they require more logistical planning. The best place to get camping gear nearby is Kangding or Chengdu. Don’t show up in Yading Village expecting to be able to rent a tent. 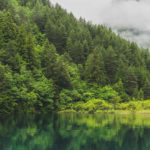 I hope this guide to travelling and trekking in the Yading Nature Reserve has helped you plan your trip! If you’re on edge about visiting Yading, just take my word for it and go. It’s a gorgeous place that’s only going to get more and more popular as the years go on. If you’ve got any questions, feel free to ask! Looking for more adventurous things to do on your China trip? Check out my post about camping on the Great Wall of China. Hi Jacob, i feel lucky that google lead me to your site, here’s really awesome! we are planning a trip to Yading this coming May, and i’m still wandering around piece & bit of information about the area. i wanna ask your advice on entering the Yading Nature Reserve, is it compulsory to purchase the “sightseeing” bus tickets on top of the entrance fee? and if it’s possible we can walk from Riwa all the way to Luorong Grasslands? that’s because we wanna do some easy trekking as acclimatization. Or if you know anywhere out of the reserve area where we could walk up to a certain height, say above 3500m? ‘m still struggling to get a map of the Riwa-Yading area so far. Hey Ethan, glad you like the site! As far as I know, the sightseeing bus is compulsory. It’s a 37-kilometre drive from Riwa to Yading Village, and it would be pretty unsafe if they let people walk along the windy road. Are you flying into Daocheng? If you spend a day or two in Daocheng, you’ll get a good base level of acclimatization as it’s at 3700m. Just drink plenty of water and get lots of sleep. Another way to get some more acclimatization before trekking in the reserve would be a night at Yading Village – it’s also at around 3700m, and has great views of the holy mountains in the park. If you spend some time in Daocheng and Yading village, you should be acclimatized enough to cross the high passes with no issues. Here is a map I found of the area – on it, you can see Riwa, the 37km road, and Yading village. thanks a lot Jacob! we will have a read into that and possibly we should do some acclimatization at Daocheng as we have already booked our hotel in Riwa~! Hi Jacob! I really enjoy reading your blog posts! Being inspired by the overland route from Shangri-la to Chengdu I am considering to go on a 4-week trip to Yunnan and Sichuan this summer and of course would want to include Yading in the itinerary. Since I would have to camp midway to do the multi-day trek, is there anywhere around Yading I could buy camping gear? Where did you get yours? As far as I know, there isn’t anywhere that sells or rents camping gear in Yading/Riwa. I did the Mt. Chenrezig kora in a single day, so I didn’t bother with camping gear (I would’ve liked to spend more time trekking/camping in the area, but alas I didn’t have any gear). If you’re starting in Shangri-La, I’d guess there’s a good chance you could get gear there but I don’t for sure. There are definitely places to get gear in Chengdu and Kangding if you’re coming from the other direction. Hope this helps a bit! Sorry I don’t know too much about getting gear in Yunnan. Hi! Thanks for the info 🙂 Definitely helps. Guess I should consider doing the kora in a single day too! Hi! I’m solo traveler and planning to get bus from Shangri-la (Zhongdian) to Daocheng and spend 2days in Yading naiture reserve, then move to Daocheng Airport following day (my flight time is 10:30am to Xining by Sichuan Airlines). 1. Ticket & shuttle bus for Yading naiture reserve: Though still not sure whether staying 3nights at Shangrila (Riwa) town or stay 1night at Yading village, Can use same ticket for 2-3days in eather case and only required to purchase the shuttle bus ticket twice in the event of staying Riwa town whole nights?